In our consumer society we loose our feeling for technique. We produce digital products in a plastic body. What happens when they break down? We just buy another one, why make life hard when we can just buy new products? Bloomming thinks that it is better to invest in good quality products, and when it breaks…. Try to repair it. Do it yourself or do it together. It’s fun and you learn a lot about products, how they work, what the materials are and how they’re produced. Out of this philosophy design clock Delay is born. 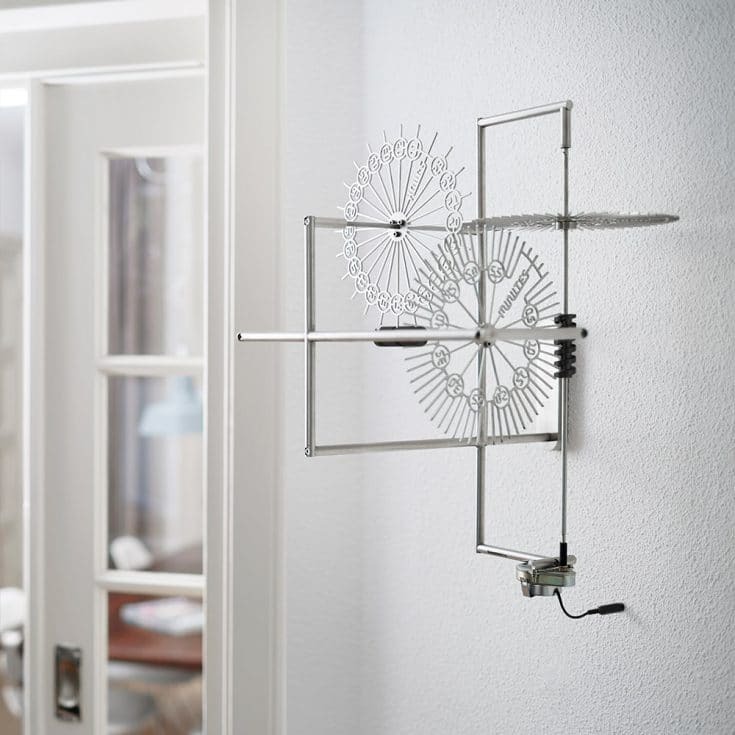 It is impressive how the technique of a clock makes it possible to show the right time. Most of the time this beautiful part is hidden inside a plastic body. Design clock Delay works the other way around and exists only out of technical parts. By showing how time works we keep our love for technique. Industrial poetry explains how time works. Quite easy actually. Design clock Delay exists of three cogwheels: One for hours, one for minutes and one for seconds. The Seconds-wheel has 60 teeth and makes 1 rotation a minute, it drives the Minutes-wheel which has also 60 teeth and because of that, it is delayed 60 times, so it makes one rotation an hour. The Minutes-wheel drives the Hours-wheel which has 24 teeth and because of that, it is delayed 24 times, so it makes one rotation a day. On the seconds-wheel every tooth is a second, on the minute-wheel every tooth is a minute and on the hours wheel every tooth is an hour. And where are the pointers so we can read time? Pointers are not necessary because you can read time at the point where the wheels nearly meet. Less is more. The unique features of a time machine. 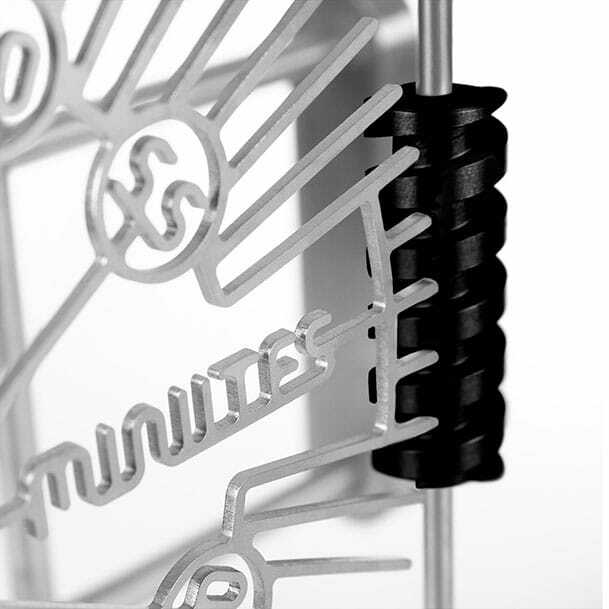 Design clock Delay is completely made of a high quality stainless steel and aluminum. The dimensions of clock Delay are 34x34x48cm (WxDxH). Clock Delay comes with a 220-240V ungrounded EU power adapter or a 100-110V ungrounded North American power adapter. Other voltages and plugs possible on request. Designed by Bloomming and produced by our metal working place near Eindhoven, The Netherlands. Every step of production from the first sketches to the final finished product is completed with care and the highest standards in mind. 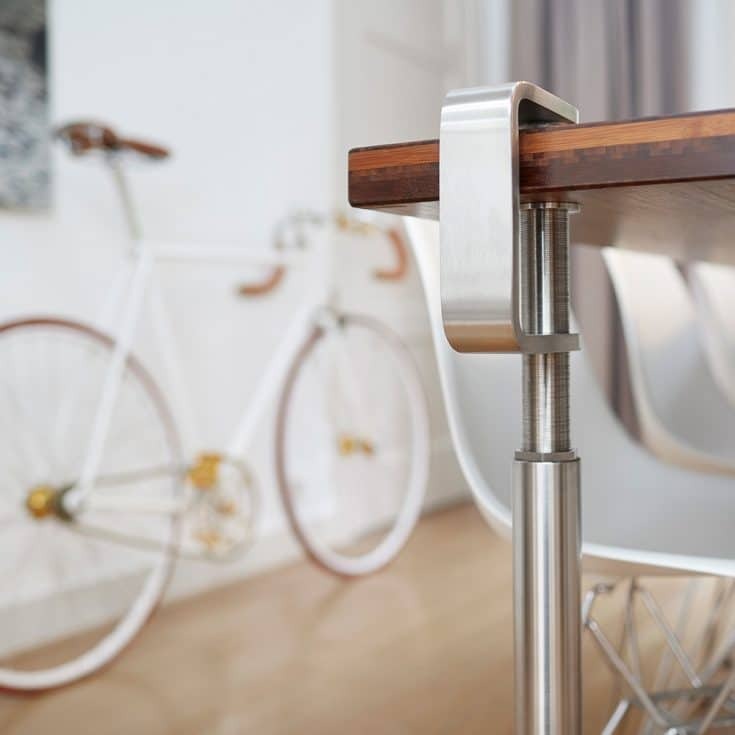 From the fine quality of stainless steel and millwork, there’s impeccable attention to every detail. Only available in a limited edition of 240 pieces. Clock Delay comes with an official Bloomming certificate. Inspiration For Your Interior & Styling! Divider Facet is rich on special silhouettes with sharp foldings and corners. Together these shapes contain the perfect balance! 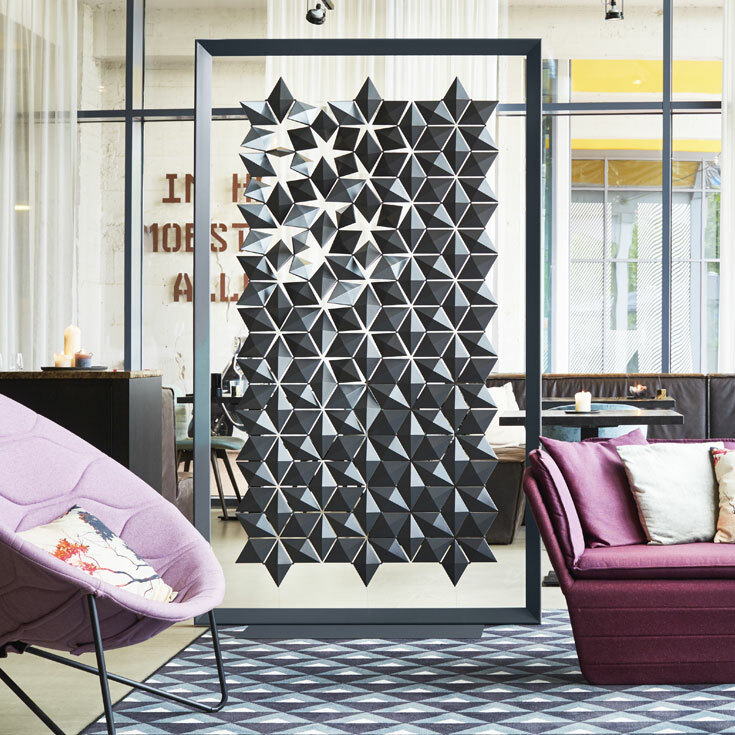 Be inspired with room divider Facet! Our divider came in perfect shape with excellent support and communication from Bas. He was quick to respond to any questions that we had and made the experience of installing our divider so easy! Light Facet by Bloomming can be used as blinds or to divide a space. All the linked up diamond shapes can be opened or closed individually. These shapes can all be turned around seperately so you can play around with the light and shadow in a space. I liked room divider Facet from the very beginning since its introduction. Eventually, I bought it. The design looks just as beautifully in real life as it looks on the website. To me it is both functional and a jewel. Its interactive design allows me to alter the looks and the amount of light I want it defuses. At last, I want to thank Bas for his great and personal customer service!